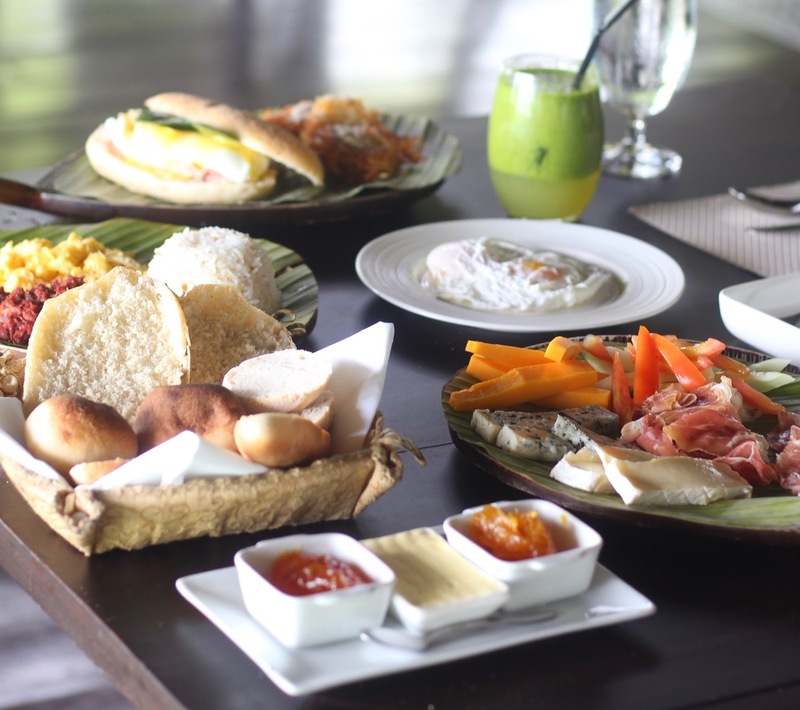 This resort has no fixed menu, except for breakfast. 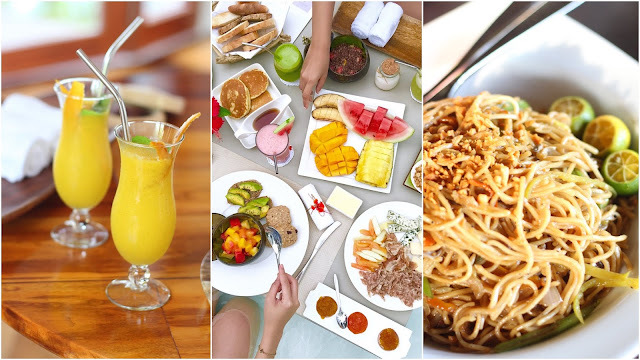 They serve barbeque lunch and fine dining dinner, both of which have menus that are decided by the chef depending on the availability of ingredients. So if there's a freshly caught lapu-lapu, then the chef will make something out of it. You also get to decide where and when you'll be eating. If you feel like eating dinner at 10pm, just inform them. There are no last calls in here! So you don't have to wake up too early just to make sure you can still get breakfast. 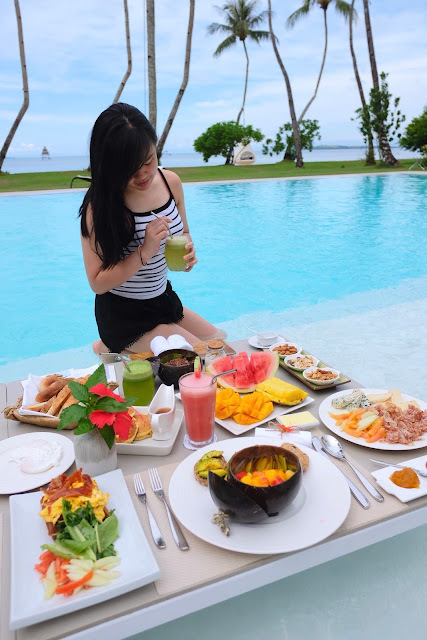 You'll also get to experience eating at different areas of the resort, but if you have a request (like our breakfast in the pool), they'd gladly grant it. We arrived the resort past 2pm, and there were welcome food and drinks ready for us in our villa. The management also had lunch prepared for us, which we were told we can eat whenever we desired (in this case, around 4pm). We had dinner on our first night at around 10pm, right after our spa session. I knew there would have to be one dish that I'd love during our stay, but I didn't think I'd find it on our first night! The risotto made with scallops, lapu-lapu and aioli was just delicious! For dessert we had a homemade chocolate and coconut ice cream, which I wasn't able to take a photo of because we had it delivered to our villa so we can eat it while watching a movie. We were supposed to have an early breakfast on our day 2 so we can have our yoga session at 9am. However, we were so busy with our photoshoot that we almost missed it! But since you get to decide when you will be eating, we had our breakfast at around 11am, before our island hopping. The Pama Haw is a plate with the catch of the day with soya sauce, coconut vinegar, and kalamansi (I skipped this since I only wanted the corned beef). Served with homemade corned beef, fried eggs, and your choice of plain or garlic rice. The Na-nay Benedict is an early-morning homemade bread filled with farm-duck poached eggs, forest ham, and topped with parmesan cheese and bearnaise sauce, and comes with a crunchy potato roti. Lami. Cheese selection, cold cuts, tomato cucumber salad, served with an assortment of local breads, butter and three different homemade jams. We had our island hopping on the second day, and Nay Palad Hideaway prepared and packed our lunch for us to have a picnic at Daku island, one of our stops for the day. After a hot and tiring day touring the different islands, we had a quiet and relaxing candlelit dinner by the beach. 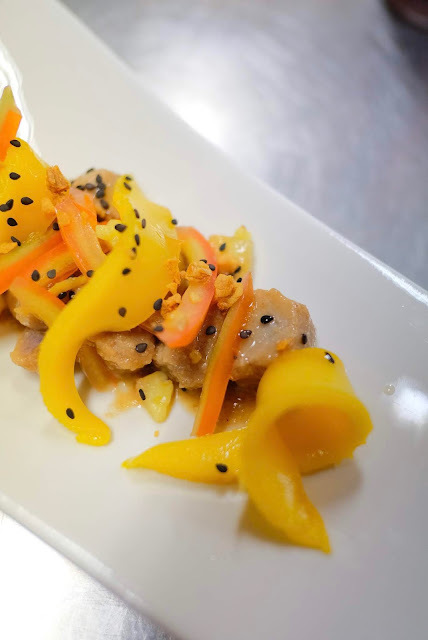 One of Nay Palad Hideaway's activities is a cooking demo with the chefs, so all photos of our dinner on our second night were taken inside the resort's kitchen where we were watching and waiting for our next meal to be prepared. The tuna with ginger and soy was nicely cooked, and had the perfect balance of salty and zing. Their caesar salad may seem basic, but it wasn't boring as it had a bed of rocket greens (my fave! ), put together with olive oil, croutons, mayonnaise egg, bacon, and sprinkled with parmesan for finishing touches. A huge slab of porchetta seared over high heat, cooked in the oven, and finished with gravy was just what we needed to regain all the energy we used from the island hopping. The matcha cheesecake with kalamansi that we got to plate ourselves had a subtle matcha taste and a lot of kalamansi tang. It was a sweet ending to an adventure-filled day. On our third day, we were scheduled to try surfing at Cloud 9. We were told to eat light breakfast, since it will be difficult to surf with a full stomach. But since we wanted to try a lot of different items on Nay Palad’s breakfast menu, we ended up having a heavy breakfast (no regrets, though!) And oh, we wanted to have it in the pool, so the resort arranged for that to happen (are you jealous?). The Lami is just one thing we couldn't get enough of. It's a board with hefty slices of cheddar, bleu cheese, brie, cold cuts, tomato cucumber salad, and served with an assortment of local breads, butter and three different homemade jams. Two days on this resort made me crave for the European breakfast favorite - waffles. 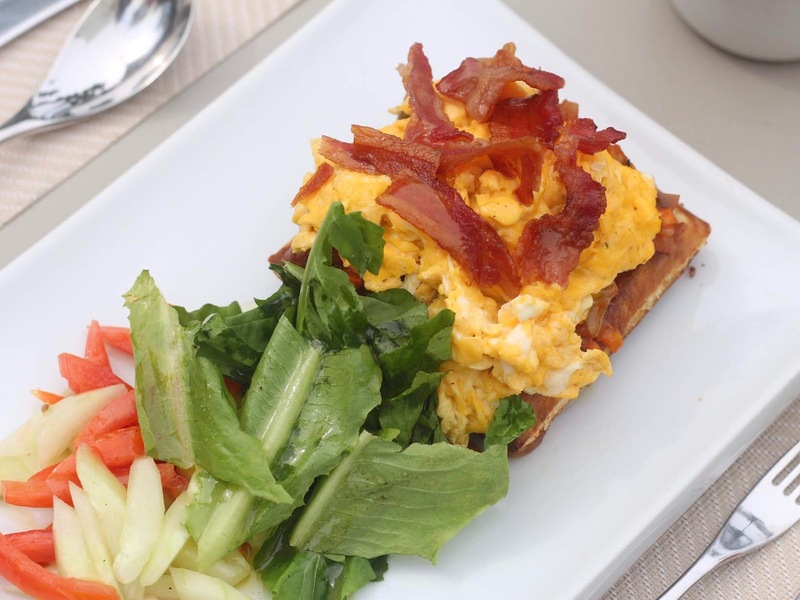 Good thing Nay Palad had the Bog-At, which is a fun version of it, topped with ratatouille, scrambled eggs, crunchy bacon, rocket, cheddar cheese, and served with a side of tomato cucumber salad for a healthier touch. If you're worried you'll lose the bikini body you've been working on for your trip, then the himsog is the an excellent breakfast choice for you. 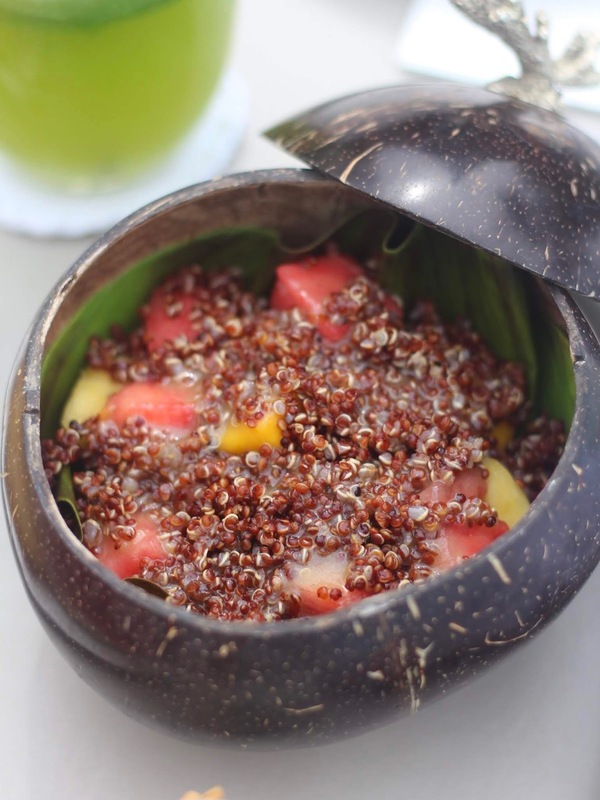 It's a salad made of fresh fruits and quinoa, drizzled with a kalamansi and basil dressing, and served with homemade yogurt, muesli, and a selection of cereals. It's a full, heavy serving perfect to start the day, without the added guilt. Avocado lovers, rejoice! The gan-ay is a whole meal bread topped with sliced bananas or avocado (seasonal) and chia seeds, served with fruit salad on the side and oatmeal cranberry cookies. There's also a bar by the shared pool where you can mix your own cocktails, or ask the staff to make you a drink. Absolutely nothing is off limits! 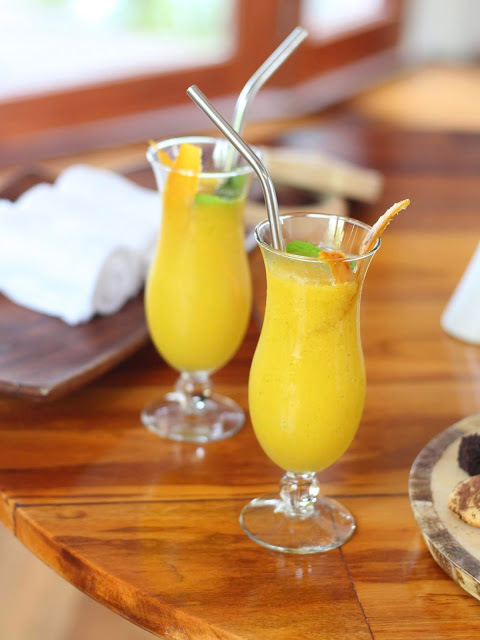 What's a trip to a beach without refreshing, tropical drinks? 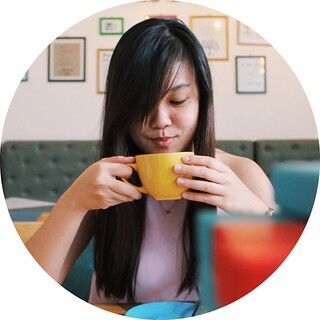 I personally loved (craved) their orange and spinach juice, which is a concoction made of apple, kalamansi, celery, and ginger. It was so good that it didn't really taste healthy!